Long peace = 20th C most numbers of deaths but not most percentages deaths per population. 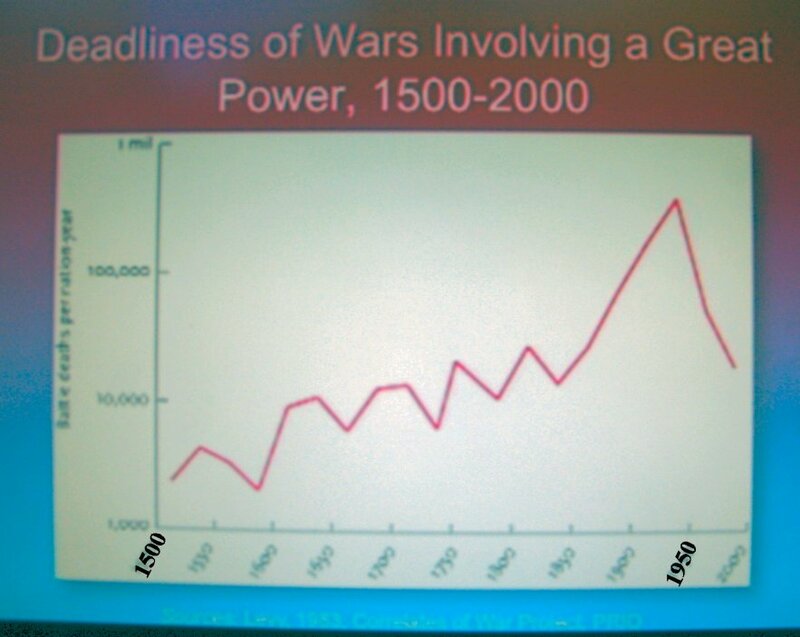 Atrocitologist Mathew White (atrocitology.com) documents the 100 worst things we did to each other between 500bc to 2000ce.By percentage deaths WII comes in at 9th place, WWI doesn’t rank in top 10. The worst atrocities are evenly scattered over 2500years. Top 10 by numbers of deaths – Atlantic Slave trade 16 million, Tamerlane (mongol) 17 million, Mideast Slave trade 19 million, Stalin 20 million, Taiping (China) rebellion 20 million, Fall of Ming Dynasty (China) 25 Million, famines in British India 27 million, Mao Zedong 40 million, Genghis Khan 40 million, Second WW 65 million. Deadliness of wars have done a U turn since 1950s. There is a rise in civil wars as inept governments vs revolutionaries. New Peace. Democracy trade and international community all provide incentive structure for peace. All of these increase since 1950s. And now more democracy, more International trade, more international organisation. Rights revolutions: Racial minorities, women children, homosexuals. Lynching has been eliminated in the USA. Why has it declined: Human nature is complex and inclination toward violence and peace. Violence happens when it is related to removing barriers to dominance or desire through individual or ideological motivation. Peace happens as an outcome of self control, sense of consequences, empathy, moral sense, and reason. Historical developments that decrease violence equates to a leviathan of justice that deters everyone. It gains weight with an appreciation of the negative sum gain for violence but peace is positive sum gain and, an expanding circle of community (empathy applies to a narrow circle in normal situations) through cosmopolitanism (literacy, communication, sharing sdtory, digital communication). Over history we have been on an escalator of reason, working out how to simultaneouls agree to put aside violence. To find out how to do this better we should ask ourselves, why is there peace? This entry was posted in Peace, Society by owen59. Bookmark the permalink.